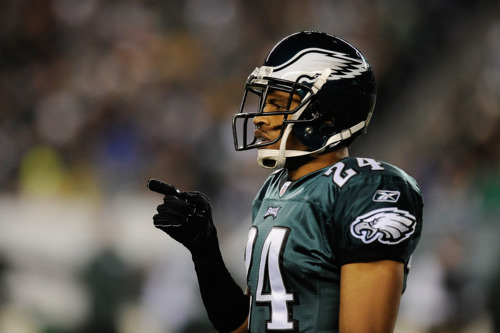 What the Eagles did: Cornerback was a mess last year. We’ve been over that. You can’t just throw three Pro Bowlers with different styles together and expect things to work out of the box. Thus, the inevitable happened: Asante Samuel was shipped out of town. What the loss of Samuel means to this defense is tough to gauge. On one hand, he’s still a great cornerback. While his interceptions were down in 2011, other stats showed that Asante was as good as ever. On the other hand, his limited style of play clearly forced running mates Nnamdi Asomugha and Dominique Rodgers-Cromartie into suboptimal positions. Asomugha has historically shined when he locks on one of the opposing wide receivers, and Rodgers-Cromartie’s closing speed makes him a better fit on the outside. Now they can play the way they want, and it’s up to new secondary coach Todd Bowles to make them comfortable. So far the talk has been that the coverages are simpler, which should be a relief to fans. The numbers (re-posted below) show that Nnamdi and DRC can both be very effective starters — as long as they’re playing in the right spots. Another downside to losing Samuel, however, is that the depth behind the Eagles two starters is relatively murky. Who are the backups on the outside if either player gets hurt? Curtis Marsh, second-year player out of Utah State, is athletically gifted, but is a relative newcomer to the cornerback position. He played a grand total of 13 snaps last season, and still needs to shed the “project” label. Brandon Hughes is entering his fourth year, but hasn’t proven he can even be Dimitri Patterson yet. Then you have a wasted 2010 fourth-round pick in Trevard Lindley, as well as undrafted free agent and apparent head case Cliff Harris. Inside, in the slot, we have an interesting battle shaping up. Joselio Hanson, the designated nickel corner in this defense since 2007, I believe, was cut last year before being re-signed at a lower price. Clearly the Eagles think he’s replaceable. And they brought in his replacement, or at least heir apparant, in Brandon Boykin, the fourth-round pick. Boykin has all the physical skills except height going for him, and he already gained some experience in the slot at Georgia. What I would have done: The way Howie Roseman handled the Samuel trade situation was appalling. A player of that caliber should have been worth more than a seventh-round pick, but by the time he pulled the trigger the Eagles had no leverage. That said, he had backed himself into a corner (haha). Trading Samuel was the only possible solution to a problem Roseman created in the first place. Way-too-early prediction: Based on Rodgers-Cromartie’s stats above, I’m optimisic that he will be a solid outside cornerback this year. Actually, it seems prudent to lock up DRC at this point in order to grab a little bit of discount. And I’m only slightly worried about Asomugha losing a step in 2012. He should still have at least another good year or two left in the tank. The slot battle is Boykin’s to lose, and I doubt he will. After that, it would be nice to see one of the other young corners step up. Bowles coached bigger, athletic corners in Miami. Hopefully he can use that experience to mold Marsh into an NFL player. Tagged with Philadelphia Eagles, NFL, Cornerback, Todd Bowles, Asante Samuel, Nnamdi Asomugha, Dominique Rodgers-Cromartie, Curtis Marsh, Joselio Hanson, Brandon Boykin, Brandon Hughes, Cliff Hughes, Trevard Lindley, Slot, Nickel, Statistics, Coverage. June 1, 2012 by Brian Solomon.